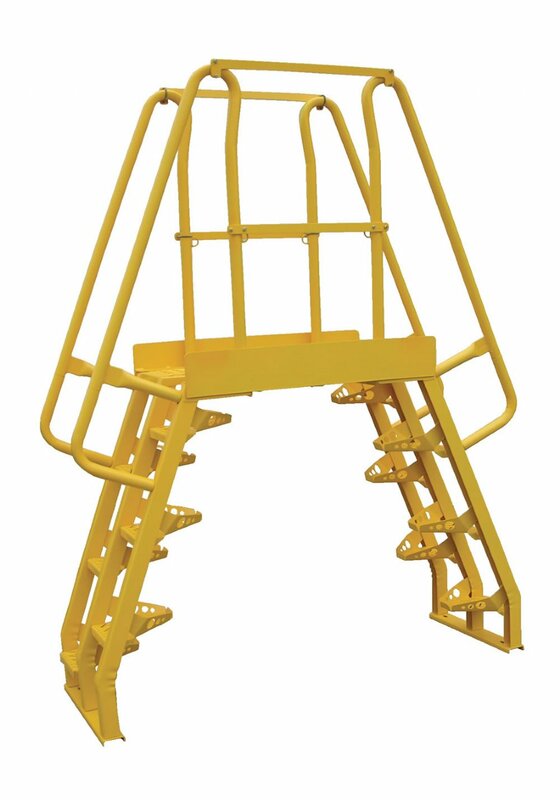 8 Step Alternating Step Cross-over Ladder, 56° Angle, 20" Clear Span, Powder Coated Steel, Safety Yellow. 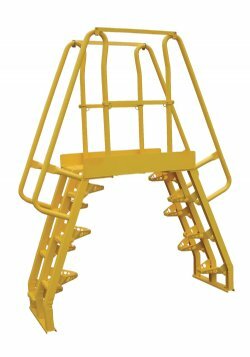 The 8 Step Alternating Step Cross-Over Ladder, 56º Angle with 20" Clear Span, is perfect where you need permanent access at crossover points. Alternating step design for shorter overall span than other units. The upper platform features removable two sided high handrail with mid-rail and fixed toe boards to prevent objects from rolling off. Includes lag-down points for securing to floor. COLA-2-56-20 4 56° 350 lbs 79" 24" 73" 26" 20" 76-3/4" 9" 10 1/4"
COLA-2-56-32 4 56° 350 lbs 86" 24" 73" 26" 32" 88-3/4" 9" 10 1/4"
COLA-2-56-44 4 56° 350 lbs 93" 24" 73" 26" 44" 100-3/4" 9" 10 1/4"
COLA-2-56-56 4 56° 350 lbs 107" 24" 73" 26" 56" 112-3/4" 9" 10 1/4"
COLA-2-68-20 4 68° 350 lbs 66" 24" 73" 26" 15" 61" 9" 10 1/4"
COLA-2-68-32 4 68° 350 lbs 73" 24" 73" 26" 27" 73" 9" 10 1/4"
COLA-2-68-44 4 68° 350 lbs 80" 24" 73" 26" 37" 85" 9" 10 1/4"
COLA-2-68-56 4 68° 350 lbs 94" 24" 73" 26" 51" 97" 9" 10 1/4"
COLA-3-56-20 5 56° 350 lbs 90" 24" 81" 34" 20" 87-1/2" 9" 10 1/4"
COLA-3-56-32 5 56° 350 lbs 97" 24" 81" 34" 32" 99-1/2" 9" 10 1/4"
COLA-3-56-44 5 56° 350 lbs 104" 24" 81" 34" 44" 111-1/2" 9" 10 1/4"
COLA-3-56-56 5 56° 350 lbs 118" 24" 81" 34" 56" 123-1/2" 9" 10 1/4"
COLA-3-68-20 5 68° 350 lbs 66" 24" 81" 34" 15" 61" 9" 10 1/4"
COLA-3-68-32 5 68° 350 lbs 73" 24" 81" 34" 27" 73" 9" 10 1/4"
COLA-3-68-44 5 68° 350 lbs 80" 24" 81" 34" 37" 85" 9" 10 1/4"
COLA-3-68-56 5 68° 350 lbs 94" 24" 81" 34" 51" 97" 9" 10 1/4"
COLA-4-56-20 7 56º 350 lbs 90" 24" 91" 45" 20" 87-1/2" 9" 10 1/4"
COLA-4-56-32 7 56º 350 lbs 97" 24" 91" 45" 32" 99-1/2" 9" 10 1/4"
COLA-4-56-44 7 56º 350 lbs 104" 24" 91" 45" 44" 111-1/2" 9" 10 1/4"
COLA-4-56-56 7 56º 350 lbs 118" 24" 91" 45" 56" 123-1/2" 9" 10 1/4"
COLA-4-68-20 7 68º 350 lbs 67" 24" 91" 45" 15" 64" 9" 10 1/4"
COLA-4-68-32 7 68º 350 lbs 74" 24" 91" 45" 27" 76" 9" 10 1/4"
COLA-4-68-44 7 68º 350 lbs 81" 24" 91" 45" 39" 88" 9" 10 1/4"
COLA-4-68-56 7 68º 350 lbs 95" 24" 91" 45" 51" 100" 9" 10 1/4"
COLA-5-56-20 8 56º 350 lbs 106" 24" 103" 57" 20" 104" 9" 10 1/4"
COLA-5-56-32 8 56º 350 lbs 113" 24" 103" 57" 32" 116" 9" 10 1/4"
COLA-5-56-44 8 56º 350 lbs 126" 24" 103" 57" 44" 128" 9" 10 1/4"
COLA-5-56-56 8 56º 350 lbs 134" 24" 103" 57" 56" 140" 9" 10 1/4"
COLA-5-68-20 8 68º 350 lbs 77" 24" 103" 57" 15" 73" 9" 10 1/4"
COLA-5-68-32 8 68º 350 lbs 84" 24" 103" 57" 27" 85" 9" 10 1/4"
COLA-5-68-44 8 68º 350 lbs 91" 24" 103" 57" 39" 97" 9" 10 1/4"
COLA-5-68-56 8 68º 350 lbs 105" 24" 103" 57" 51" 109" 9" 10 1/4"
COLA-6-56-20 10 56º 350 lbs 122" 24" 115" 69" 20" 118 1/2" 9" 10 1/4"
COLA-6-56-32 10 56º 350 lbs 129" 24" 115" 69" 32" 132" 9" 10 1/4"
COLA-6-56-44 10 56º 350 lbs 136" 24" 115" 69" 44" 144" 9" 10 1/4"
COLA-6-56-56 10 56º 350 lbs 150" 24" 115" 69" 56" 156" 9" 10 1/4"
COLA-6-68-20 10 68º 350 lbs 87" 24" 115" 69" 15" 83" 9" 10 1/4"
COLA-6-68-32 10 68º 350 lbs 94" 24" 115" 69" 27" 95" 9" 10 1/4"
COLA-6-68-44 10 68º 350 lbs 101" 24" 115" 69" 39" 107" 9" 10 1/4"
COLA-6-68-56 10 68º 350 lbs 115" 24" 115" 69" 51" 119" 9" 10 1/4"
COLA-7-56-20 12 56º 350 lbs 138" 24" 127" 81" 20" 136" 9" 10 1/4"
COLA-7-56-32 12 56º 350 lbs 145" 24" 127" 81" 32" 148" 9" 10 1/4"
COLA-7-56-44 12 56º 350 lbs 152" 24" 127" 81" 44" 160" 9" 10 1/4"
COLA-7-56-56 12 56º 350 lbs 166" 24" 127" 81" 56" 172" 9" 10 1/4"
COLA-7-68-20 12 68º 350 lbs 96" 24" 127" 81" 15" 93" 9" 10 1/4"
COLA-7-68-32 12 68º 350 lbs 103" 24" 127" 81" 27" 105" 9" 10 1/4"
COLA-7-68-44 12 68º 350 lbs 110" 24" 127" 81" 39" 117" 9" 10 1/4"
COLA-7-68-56 12 68º 350 lbs 124" 24" 127" 81" 51" 129" 9" 10 1/4"